Eco Driving Indicator Light can be activated or deactivated. 1 While the odometer is being displayed, press and hold the “DISP” switch to display the Eco Driving Indicator Light customization screen. 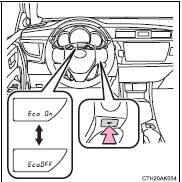 2 Press the “DISP” switch to set Eco Driving Indicator Light to on or off. 3 Press and hold the “DISP” switch to complete the setting. Allow the interior of the vehicle to warm up before using the display. At extremely low temperatures, the display monitor may respond slowly, and display changes may be delayed. For example, there is a lag between the driver’s shifting and the new gear number appearing on the display. This lag could cause the driver to downshift again, causing rapid and excessive engine braking and possibly an accident resulting in death or injury. ●Do not let the indicator needle of the tachometer enter the red zone, which indicates the maximum engine speed. ●The engine may be overheating if the high engine coolant temperature warning light comes on. In this case, immediately stop the vehicle in a safe place, and check the engine after it has cooled completely.